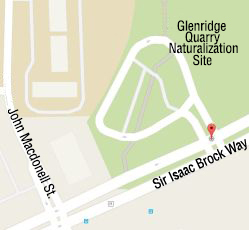 Construction starts March 25 for approximately eight weeks at Glenridge Quarry Naturalization Site. The site will remain open, but construction will cause temporary disruptions. Visitors to the site are asked to follow all signs and barriers. The naturalization site is a large public open space in St. Catharines with attractions for families, school children, environmentalists, walkers, joggers, hikers and bird watchers. May to October: 6 a.m. - 9 p.m.
November to April: 8 a.m. - 6 p.m.